The current lead fund manager is Richard H. Gao. He is assisted by Henry Zhang. Richard Gao has managed it since 1998. As part of Matthews fund, it has an expense ratio of 1.13% while the category average is 1.92%. As a no load fund, so there is also no management fee. The most recent distribution was given in December 2011 ($0.28). It has total net assets of $1.93 billion. The dividend yield of this fund is 1.16%. The investors can buy this fund through 99 brokerages, such as Merrill Lynch, JP Morgan, T Rowe Price, Schwab Retail, Dreyfus NTF, Ameriprise Brokerage, E Trade Financial, etc. The minimum initial investment is $2,500 for brokerage account with $100 minimum subsequent investment. 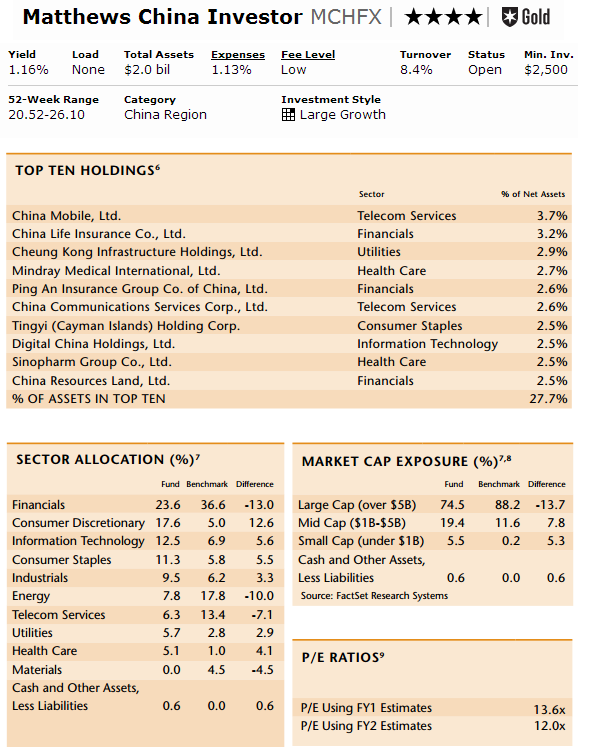 As of September 2012, the top ten holdings of this fund represent 27.7% of the total assets. 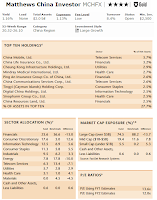 The top 10 holdings are China Mobile Ltd (3.7%), China Life Insurance Co Ltd (3.2%), Cheung Kong Infrastructure Holdings Ltd (2.9%), Mindray Medical International Ltd (2.7%), Ping An Insurance Group Co of China Ltd (2.6%), Tingyi (cayman islands) Holdings Corp (2.5%), Digital China Holdings Ltd (2.5%), Sinopharm Group Co Ltd (2.5%) and China Resources Land Ltd (2.5%). According to the fund prospectus, the principal investment risks are political, social and economic risks, Currency risks, volatility risk, emerging and frontier markets risk, trading markets and depositary receipts risk, risks associated with China, Hong Kong and Taiwan, etc.